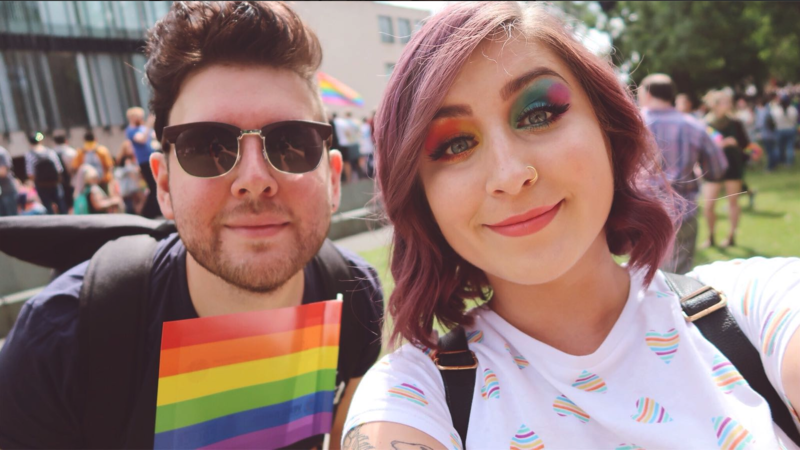 Newcastle Pride 2018, what an incredible event. We arrived at Newcastle Civic Centre (the starting point for the parade) and the atmosphere was electric – to me it felt like when you use a mint body wash and you start to feel the cooling tingles! It was so nice to see so many big companies get involved, many had printed tee shirts for their employees such as the Co-op, Sky, the NHS, Sainsburys, and Nandos – Northumbria Police and Tesco were even handing out rainbow flags to show their full support for the event; all doing so with the biggest smiles on their faces. Walking through the crowd it was as if we had all been friends for a long time but had lost touch and had reconnected over a coffee. We all couldn’t stop talking, singing, or even dancing with one another. We took selfies with stilt walkers and were in general awe of the most amazing and creative costumes ever seen by man - the sheer amount of skill and colour shown was astonishing. We readied ourselves for the parade and positioned ourselves right next to a speaker that was blaring out “Finally by Ce Ce Peniston” as I mimed to the song, like the extreme pro that I am, the parade officially started. The almighty noise of people cheering, whistling, and whooping was deafening - officially there were around 20,000 parade goers so you can imagine the amount of noise that was coming out of us! The parade left the Civic centre and continued down one of Newcastle’s busiest streets (Northumberland Street). The amount of people stood watching the parade was unbelievable. At first, I didn’t want to look at the public as if they were going to look on with an old school judgemental stare, but I was wrong, so very wrong. 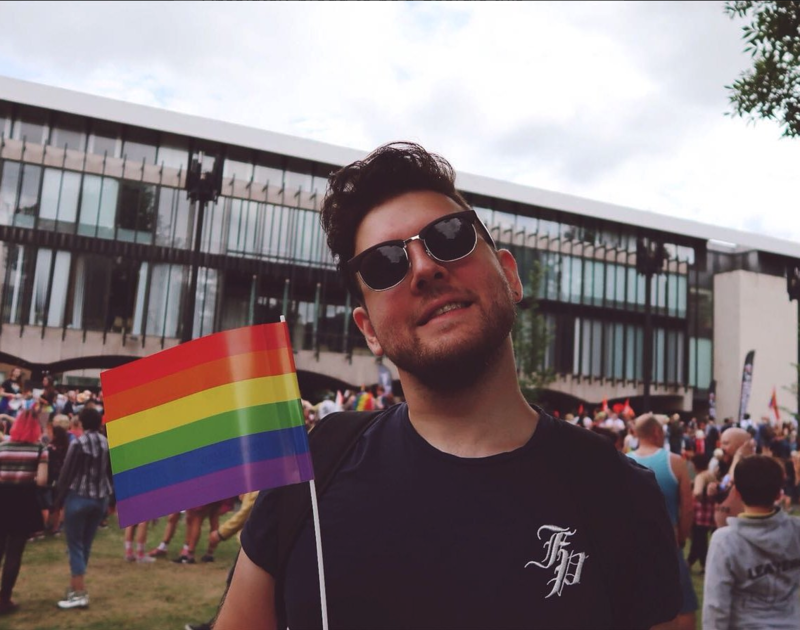 I looked up and saw people of all ages cheering for the parade, waving to anyone who would look their way, even taking pictures and videos whilst smiling – I honestly got a little emotional seeing a VERY old couple hold hands whilst waving at the parade, times are truly changing. One of my biggest highlights of the day may sound very cheesy but it’s Pride so we’re allowed a nice slice of cheddar! As we approached the side of Intu Eldon Square with the rainbow zebra crossing (Nice touch Newcastle!) we all walked through a tunnel, and then there it was… the cacophony of noise, the whooping of a people who were as one, the almighty cheering of the proud! Honestly, it was incredible, and even thinking about it now you could say “it was only a tunnel”, but to actually be there and feel the emotion, and get the mightiest of goosebumps. That will be something I’ll always remember when I continue to support pride every year. We then walked to Nuns Moor Park (where pride was held this year) and got food, drink, ice creams and went on as many rides as we could - all whilst trying to hold the food down! We then walked through the stalls to hear how we could support different people, countries, or charities, and it was especially nice to see how friendly everyone on the stalls were. It was also nice to see the NHS had lots of its workers there to spread awareness of services they provide that many possibly didn’t know they did. Was it the big top (previously used at Reading and Leeds festivals) with music continuously blaring out? Was it the amount of smiling faces you saw? Was it the “tunnel of sound” like me? I hope that you feel proud of who you are on a daily basis and looking on I hope you know that we were on the right side of history. P.S. 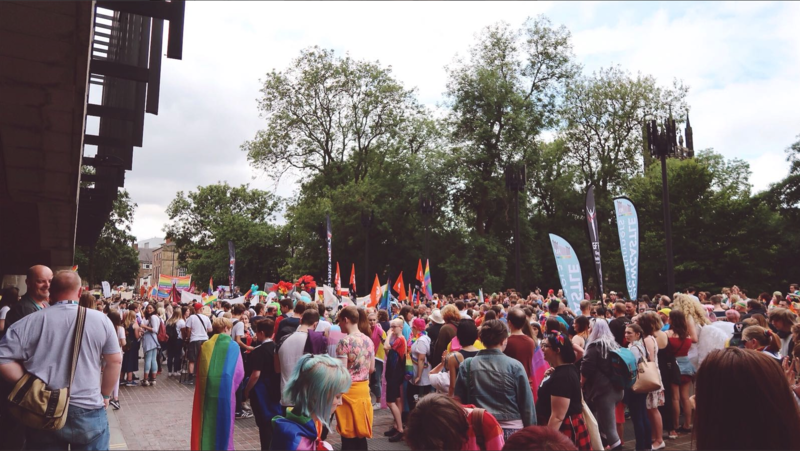 If you liked this blog I'm sure you'd love Bridget's blog about Durham Pride 2017 where she was one of the official drummers!